While using your computer and saving your files, you suddenly receive “You don’t have permission to save in this location. Contact the administrator to obtain permission” message, and now you are worried. Well, worry not because in this article I’ll guide you step-by-step on how to get rid of this error forever. So without further ado, let’s get started. How to Fix You don’t have permission to save in this location error? 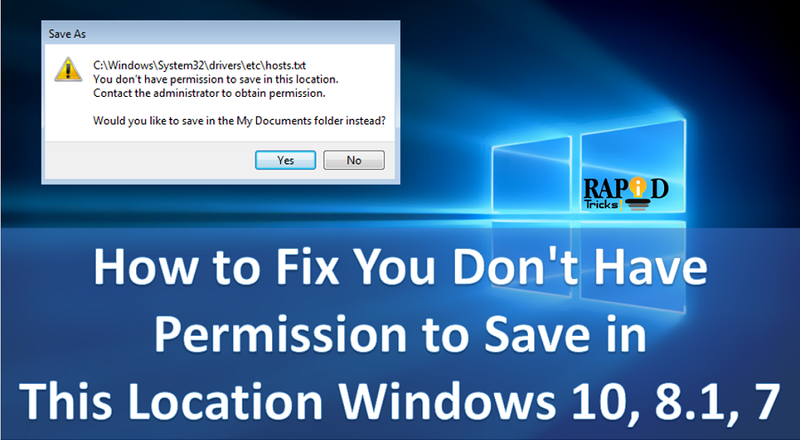 There are various solutions to fix this issue on your windows system, but we are going to tell you the most effective solutions for fixing You Don’t Have Permission to Save in This Location error in Windows 10, 8.1, 8, and Windows 7. You would be also interested in learning “How to find and delete duplicated files on Windows PC“. Step 1: First of all, right click on the directory with the problem and select properties from the menu. Now you will see few tabs at the top. Step 2: Next, head over to the Security tab, and hit Edit. Step 3: Now, select Administrator from the menu and click on Edit button, Now hit the checkbox saying Allow for the Full Control option. Once granted the full administrator access, the problem should be completely resolved, and you’ll never see this message again. Step 1: Hit the Windows Key + S and enter user account. Next select Change User Account Control settings. Step 2: You’ll see a slider, move it all the way down to the option that says “Never Notify” and hit OK.
“You don’t have permission to save in this location” messages usually comes when you don’t have the full administration rights of the system you are using. In this case, the best way to remove this error is using “Run as Administrator” option. After this, your problem will be resolved. Nevertheless, do note that this is not a permanent solution and you’ll have to run the application as an administrator every time you want to save the files in that location. Step 1: Right-click on the folder on which you are restricted and being shown these message. Now you will see the properties option at the bottom. Step 2: Select “Properties” the last option shown in the options list. Step 3: Go to Compatibility tab and check “Run this Program as an Administrator” and hit OK.
Once done, now you won’t have to run the folder every time as an administrator it will automatically run as you have mentioned it in the settings. That was it for this error, so I hope now you can easily fix the error “You don’t have permission to save in this location” on any version of windows. If you have any further doubts don’t forget to leave a comment down below, and I’ll further help you out.